Breast cancer is graded on a scale of 0 to 4. The earliest stage of breast cancer is stage 0, which is where all DCIS is staged. When referring to the stage of a DCIS, it is actually the distance of which the cancerous cells have spread beyond the location of the original tumor. It is always considered a stage 0; however, it is possible for it to be any size, as well as located within the breast in any number of areas. When you and your Doctor know the grade and type of DCIS that you have, it is easier to decide on the best treatment for you. When you have a biopsy performed, a pathologist will review the tissue samples retrieved under microscope in order to determine if there any abnormal cells present. If the pathologist identifies any abnormal cells, they will send a report of the variation between the abnormal cells in the healthy, normal breast cells that surround it. The image shown illustrates the possible range of findings, progressing from a normal cell to a fully invasive ductal cancer. There are six categories in which to classify the condition of a breast cell. The first is normal cells. The second is ductal hyperplasia, which means there is an overgrowth of the cells within the tissue. The third is atypical hyperplasia, which means too many cells are accumulating and beginning to develop an abnormal appearance. 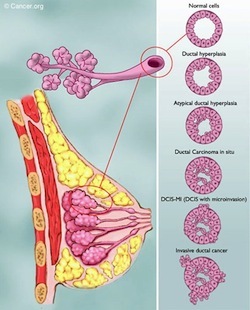 The fourth is ductal carcinoma in situ, which indicates too many cells are present and include the features of cancer; however, they remain within the confines of the milk duct. The fifth as DCIS-MI (ductal carcinoma in situ with micro-invasion) which means that some of the cancer cells have begun to break through the wall of the milk duct, and this is treated more seriously than traditional DCIS, as it is considered a more serious form. The final category is invasive ductal cancer, in which the cancerous cells have broken past the milk duct. Once the cells reach this category, they are no longer ductal carcinoma in situ, but instead are an invasive ductal carcinoma, which is the most common type of invasive breast cancer. Grade I and grade II are slower growing, and are often described as “non-comedo.” This term means that the tumor does not contain many dead cells, which indicates a slow-growing cancer because there is sufficient nourishment for all the cells to feed off. The faster a tumor grows, the more quickly the cells within it begin to die out at a faster rate. Grade I looking very similar to normal or atypical ductal hyperplasia cells, and grade II cells look less like them. The higher the grade, the greater the chance of recurrence and/or the development of the new cancer. The speed at which a new cancer develops is also affected by the grade of DCIS. There are three patterns of low- to moderate-grade DCIS; papillary, cribriform, and solid. Papillary cells are most similar to normal cells, with large gaps between the abnormal cells and the healthy cells. Cribriform DCIS has smaller gaps between the two types of cells and resembles the hole pattern in Swiss cheese. In a solid DCIS, the affected breast duct is completely filled with cancer cells. High-grade pattern DCIS, or grade III, the cells are fast-growing and vary significantly from normal, healthy breast cells. Individuals with grade III DCIS have the highest risk of invasive cancer, either at the same time DCIS is diagnosed, or at some time in the future. The speed of which cancer is likely to come back is also greater, with the risk of recurrence within five years being greater than after five years. This grade of DCIS is called “comedo” or “comedo necrosis” because the cells have a large amount of dead or in aquatic cancer cells, which often build up within the tumor. Quick growing cancer cells require a lot of nourishment, and the cells that do not receive enough nourishment will die off, which leaves areas of necrosis.